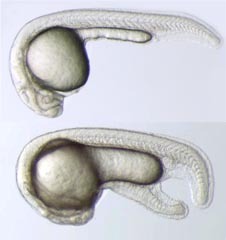 The stimulation of Nodal and BMP signaling pathwayat the animal pole of a zebrafish embryo results in the formationof a second tail (embryo at the bottom) comparedto wild-type embryo (top). Courtesy of Thisse lab. Organogenesis is the process of formation of organs from three germ layers. It concerns cell-cell interaction, cell fate determination, cell proliferation and survival, cell and tissue shape and size, and arrangement of cells into tissues and ultimately functional organs. Subsequent to their formation, some organs and tissues can repair and replace themselves for homeostasis or following disease and damage, while others cannot. Some tissues only possess the regenerative capacity for a limited period of time. How complex structures are repaired and replaced following damage is a question that is addressed through the study of regenerative biology. In addition to exploring mechanisms of regenerative growth and cellular respecification, significant questions in regenerative biology remain to be answered about where and when regeneration can happen, how and why regenerative signaling is constrained by development and evolution, and how to engineer tissues in vitro. Study of organogenesis serves as the foundation for research in regenerative biology, where generation of cells and tissues in vivo and in vitro commonly employ regulatory programs underpinning organogenesis. Investigators in the Department of Cell Biology are tackling the control of regenerative capacity and the formation of multiple organs with cutting-edge molecular, cellular, and genetic approaches using diverse experimental systems including model animals, and organoid and cell cultures. Work in the Department has provided novel insights in organ development and regeneration, and will capitalize on its expertise in these areas as wellas in development and morphogenesis to advance tissue engineering.